This topic and the way it presented was very nice and easily to understand. Describe scientific applications of the Multisensor Precipitation Estimator (MPE) software. 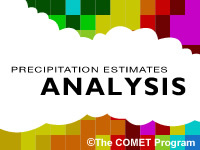 List some of the related precipitation estimation programs used within MPE. Differentiate between the different MPE precipitation fields: single-sensor, bias-adjusted, and multisensor. Describe the basic science used in bias-adjusted radar QPE. Explain the differences between local and field bias adjustments. Describe the basic scientific approach used in multisensor fields. Describe the advantages of multisensor QPE. Explain what MPE's best estimate QPE is. Describe how MPE gauge editing tools can be used to improve gauge analyses. Explain when a pseudo gauge might be used. Explain how polygon edits may be used to improve the utility of QPE. Explain how bias information, such as the local span, can be used to assess the representativeness of a bias adjustment factor. Differentiate between some of the primary QPE issues related to warm season, cool season, and non-precipitating echoes. Apply some case-specific lessons of generating QPE including: dealing with poor radar coverage, bright band, intense convection, warm rain, snow, and ground clutter.